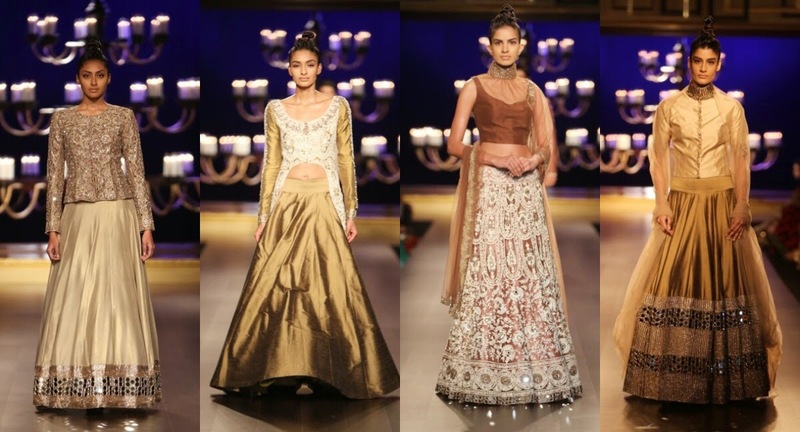 It was a Vintage spectacle and contemporary Silhouettes By Fashion Designer Manish Malhotra. Call it Pre-show whispers or anticipation, we dress our very best for the only designer we know would bring about some expected crowd- pleasers and make stardust descend and smile for the Camera and show support to their designer Amigo. The fun began as the Bollywood Actresses Huma Qureshi and Urmila Matondkar started turning it out in the front rows. It was a full house, and I had a quick chance on those shaky Escalators of Taj Palace, to turn around and have a green room chat moment for about 40 seconds with the man himself ,Just a day prior to his couture Extravaganza.I could understand two things-1: The show is gonna be big as he himself was short of the invites.2: Expect lot of Pushing and shoving and for the love of God-wear flats ! It was a three way ramp,marking the beginning of the show, adorned with, flickering candles in antique candle stands ,Chandeliers and all things vintage.The moment I entered, the Set looked liked nothing different from any Sooraj Barjatya movie minus the signature staircase, maybe next time Manish if you are reading . In Manish's word- The collection marked "PORTRAITS "as the name suggests is an endeavor to translate the magic of a bride's most special moments and weave them into tactile expression. The collection started floating down the runway with Lehengas in heavy Gota work on Raw silk and models swamped the ramp dressed in Gold and minimal Jewellery except the Nath(nose ring). 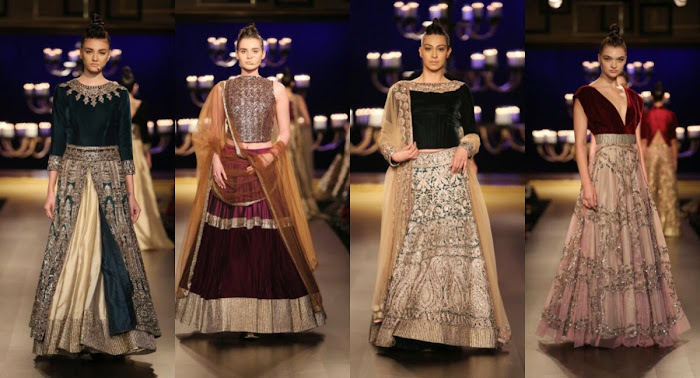 Manish's love for Velvet and Chikankari and Kashmiri Zari work was pretty evident and won much of an applaud too. Portraits- revealed presentations of Earthy cocoa and bright and sultry Blood Red "Cholis" (short blouse)in Velvet with mirror work Lehengas. The second part of the collection also saw some jewel toned colors in Emeralds and Reds in fabrics like silk and tulle which effortlessly recreated the play between then and now. 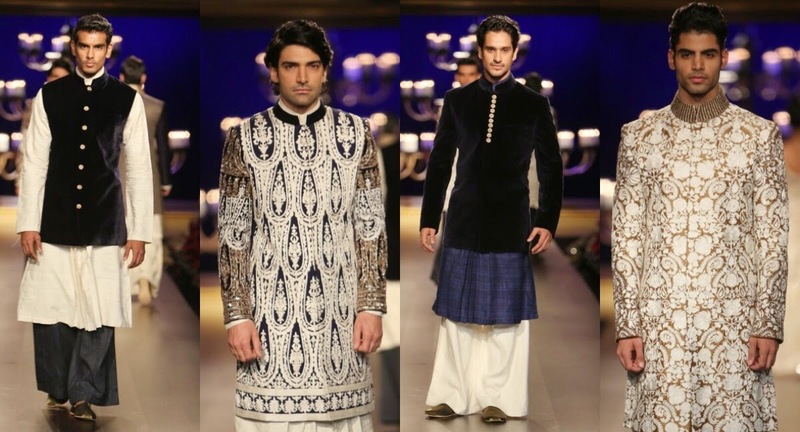 To get the vintage quotient a notch higher, the men wore Spectacles taking back to Nostalgia of Nehru era, and the transition from old to new and easy adaptability of fashion for today's experimental Bride and grooms. 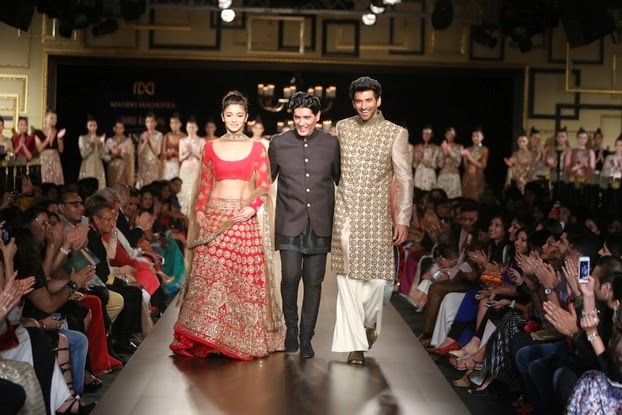 Talking of the transition , Show stopper Alia Bhatt was a perfect choice to depict the same and bring out the essence of theme dressed in a beautiful Cherry red Lehenga, while Aditya Roy Kapur looked handsome and happy in an Ivory Sherwani.